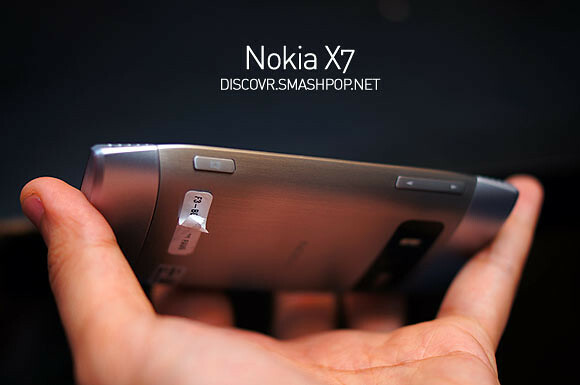 Nokia recently announced the X7, an entertainment smartphone powered by Symbian Anna. The latest version of the OS which promises to bring new and enhanced features with a brand new slew of icons. We have reported the launch a while ago and you can read it here. discovrpOp was invited to an intimate session with Nokia Malaysia to have a hands-on preview of the X7 and the E6 which will be made available in the market very soon. 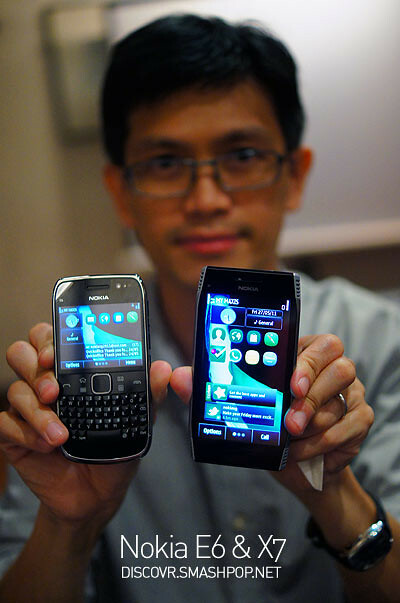 Mr. Glen Cha, Product Manager, Nokia Malaysia, showing us the 2 new devices with Symbian Anna built in. FYI, the X7 is made of toughened glass and seamless stainless steel with a 4-inch screen which is set to stand out in the crowds. On hand, it felt slippery and the somewhat sharp edges on both sides of the phone may not offer the best grip for users. The screen is very bright and colours do pop. Much like the AMOLED screen on the E7, this screen is great for viewing videos and photos as the viewing angle is quite wide. This is how sharp both sides of the phone are. Bear in mind that the speaker like design on all 4 corners of the phone…. are not speakers. Haha. The X7 was designed like that for aesthetic purposes only. The X7 has 2 speakers. One under the ‘menu’ button below the screen and another one in the earpiece. 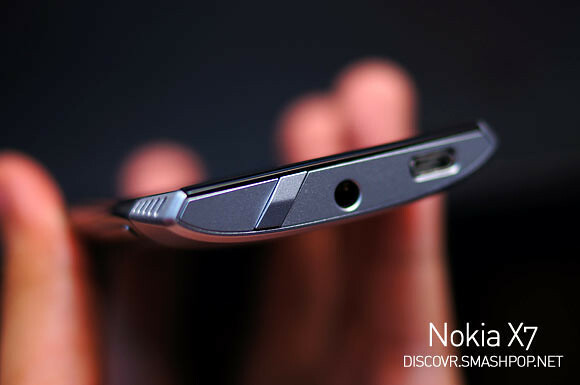 The curved backplate looks stunning with brushed metal texture. Definitely different from usual cellphone designs in the market. 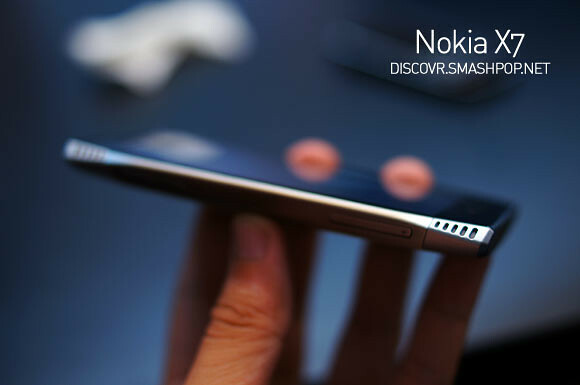 Camera button and volume toggles are placed towards the back of the phone due to the curved edges. To be honest I did not like the placing of the buttons. Pressing them might cause you to drop your phone since the brushed metal back is slippery. The device measures 119.7 x 62.8 x 11.9mm (thinner at the edges) and weighs 146g. It offers Pentaband 2G/3G network connectivity and 802.11 b/g/n WiFi support. It offers a 3.5mm audio connector for headphones. Beside the audio connector lies the on-off button which looks modern and really blends into the futuristic design of the X7. On the other side of the top plate spots the micro USB port. Users can use this as a port to transfer data to the computer, USB-on-the-go purposes (connecting the X7 to external storage) or simply just a USB charger. As usual, China makes everything in this world. LOL kidding. 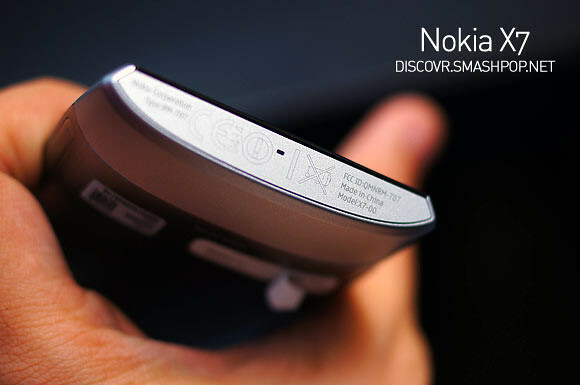 The 8-megapixel full focus camera also offers 720p video recording and comes with a dual LED flash. The Nokia X7 comes with 8GB memory card pre-installed, with up to 350MB built-in operating memory. It can support MicroSD cards up to 32GB. So how good is the camera? Well if you have tried the E7 then you should know… or you can check out our post on the full-focused camera with sample photos here. 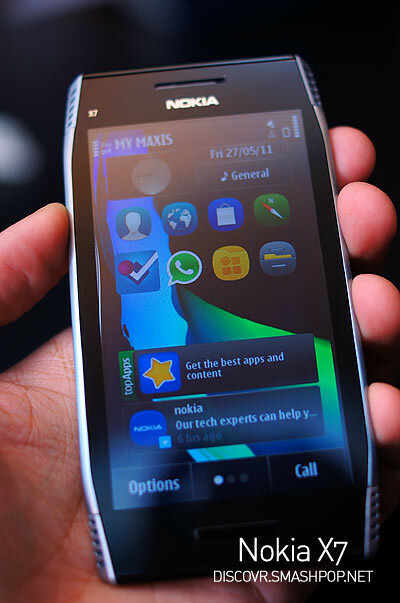 Here’s a video of the interface, homescreen, new browser, Nokia Store, Fruit Ninja and many more. The Nokia X7 is expected to be released around July-Sept and price is not announced yet… but based on the 380 Euro price indicated at the announcement, you can roughly calculate and predict the price already. 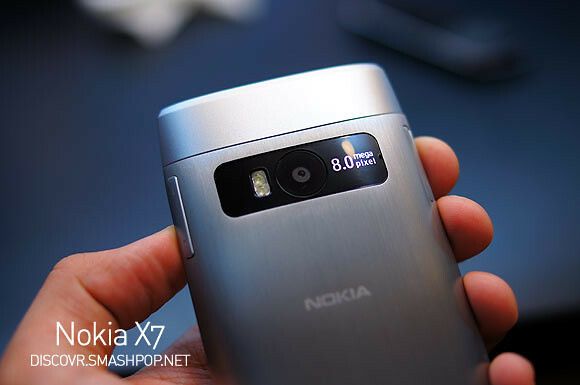 2 Responses to "Nokia X7 Hands-On With Fantastic Close Up Photos & Video"